"Let's turn on the juice and see what shakes loose!" Do you know someone who needs some help getting rid of some of those pesky living people? The ones who have taken over your friend’s house? Your friends complain about the gaudy decorations they have put up, and all the séances the new family hold to try to get rid of them. It’s a nightmare. But luckily, they have a friend like you. Someone who knows how to really annoy people when they want to. It’s like a superpower. You love playing practical jokes, and making people jump from silly scares. You were basically born to be the ultimate jokester, the only person who could help your spirit friends with their little house guest problem. You are missing just one thing to make you the best prankster. Just say Beetlejuice. Beetlejuice. Beetlejuice. Then click on the “Add to Cart” button, and become the best prankster in the spirit realm with this Beetlejuice Full-Head Latex Mask with Hair. You’ll be able to oust those nuisance house guests for your friends. 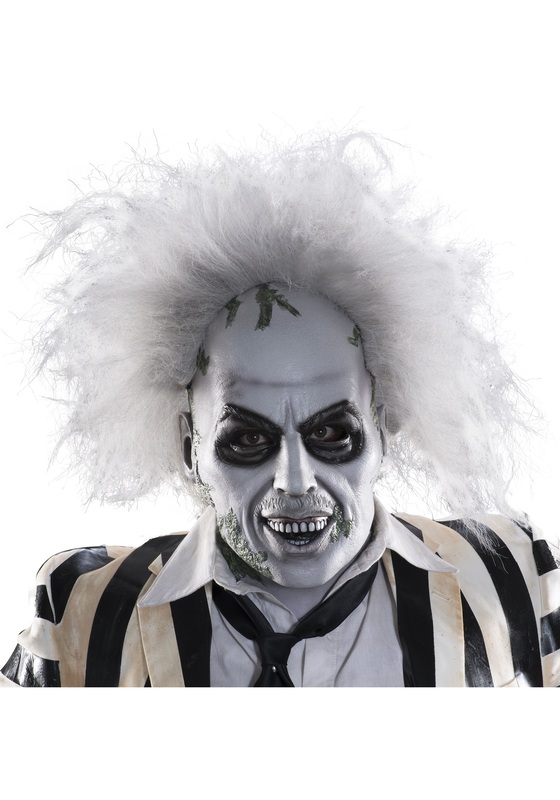 All while looking as awesome as the original Beetlejuice. Just beware of calling on any sandworms to help you out in your attempts to annoy the new living people in your friends house. We hear that they are a little tricky to control. Good haunting friend!